According to the U.S. Department of Labor, slips, trips, and falls cause substantial and severe injuries throughout the United States every year. For instance, in 2014, there were nearly 3 million workplace injuries and illnesses dispersed among a wide variety of occupational settings. One of out of every three of these injuries resulted in an employee missing one or more days of work. Furthermore, workplace incidents now constitute the second-leading cause of accidental death (15% of all cases) in the United States after motor vehicle crashes. They also cause 95 million lost days of work per year. These numbers might seem shocking, but they should also serve as a reminder that no one is immune to a workplace accident. Fortunately, you can reduce your risk of suffering an injury at work by following just a few simple safety tips. Keep in mind that in Maryland, for the purposes of workers’ compensation benefits, it doesn’t matter if you or your employer was at fault if you’re injured in a workplace accident. You may be entitled to compensation for medical bills, lost time, and time off from work if you’ve suffered an on-the-job injury, and if you have permanent restrictions, you may be eligible for additional payments. If you’ve been hurt at work, don’t waste any time before you act — notify your employer of the injury and then contact the attorneys at Pinder Plotkin immediately about filing a workers’ compensation claim. Even though fault isn’t a factor in Maryland workers’ compensation claims, we always want to promote workplace safety and help workers avoid injury before the fact if possible. With that in mind, here are some of the most effective safety tips to reduce slips, trips, and falls in the workplace. 1. Maintain clean and clear surfaces, stairwells, and walkways. Slippery stairwells, poorly-lit hallways, and cluttered office spaces or work sites are some of the most common precursors to serious workplace accidents and injuries. The best way to mitigate or even eliminate these injuries is to create a company-wide plan that doles out various housekeeping responsibilities to employees. For instance, you might assign your accounting department to keep the bathroom tile swept, mopped, and dry one week and then rotate them to shoveling and de-icing the sidewalk and parking lot the following week. These tasks can rotate between other departments at regular intervals. Also, always display “wet floor” signs wherever applicable and use absorbent mats and rugs in entrance ways, kitchen areas, and other high-traffic sections of the workplace. Finally, make sure to clear all throughways of cords, cables, and clutter to eliminate tripping hazards. 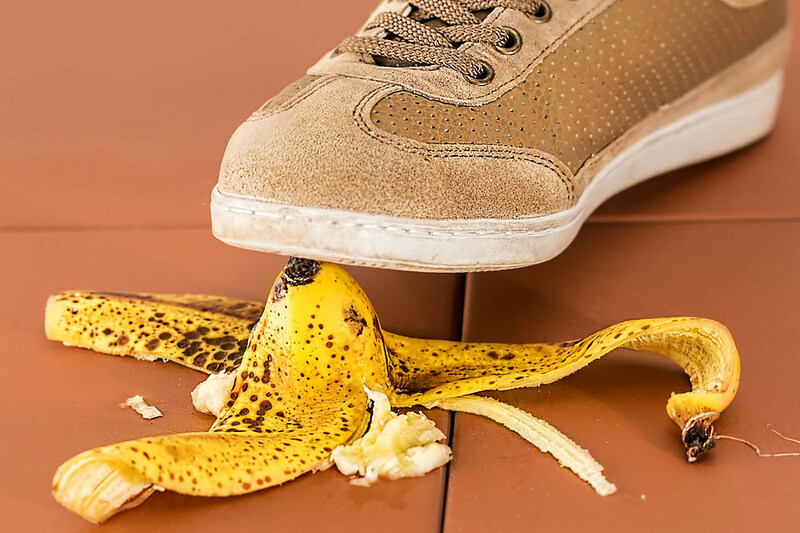 One of the leading causes of slip-and-fall accidents is inadequate footwear. In order to reduce slips, trips, and falls throughout the workplace, you should choose footwear that is appropriate for the tasks you are expected to complete as part of your occupational duties — especially in snowy, rainy, or wet conditions. Your shoes or boots should have ample traction, and if you have shoelaces, be sure that they are properly tied at all hours of the day. If you’re worried about committing a potential fashion faux pas by wearing functional shoes, keep a pair of heels or loafers onsite that you can change into as needed. 3. Be mindful of your surroundings. Above all, you should remember to stay fully aware of your surroundings to avoid slips, trips, and falls at the workplace. Poor lighting, inclement weather, and updates to the office or worksite can make it difficult to navigate otherwise easily passable terrain. Never walk into an unlit room without turning the lights on, and keep dimly-lit areas of the office clean, dry, and free of clutter. Lastly, stay up-to-date regarding any changes to your workplace environment, and try to avoid hurrying through the office or jobsite, even if you are late or working against a deadline. Even the best workplace safety tips can’t completely eliminate the risk of a slip-and-fall accident. If you find yourself injured due to a slip, trip, or fall —or by any other form of workplace accident — please contact the legal team at Pinder Plotkin right away. The Pinder Plotkin Legal Team has litigated hundreds of workers’ compensation and personal injury cases, and we frequently receive referrals from other firms who know our reputation and trust our experience and dedication. Our contingent fee policy ensures that you only pay fees and expenses if and when we achieve a recovery on your behalf. Please call us today at (410) 661-9440 or fill out the form on our contact page to receive a free consultation. We will use this time to assess the details of your case and advise you about your best course of action going forward. You have only two years from the date you discovered your injury to file a workers’ compensation claim in Maryland, so don’t wait to act — get in touch with us today.